The Faroes are a seabird country. Magnificent bird cliffs where fulmars, guillemots and similar birds whirl before landing on narrow ledges, provide excellent and dramatic images. This is the country of puffins with grassy hillsides sloping towards the sea, where clumsy but charming puffins dig their holes - or the Mykines islet which in summer is white with large nesting gannets – these images describes almost perfectly the outside world’s view of Faroese nature. It is therefore no wonder that viewers tends to overlook one of the most common bird in the islands. 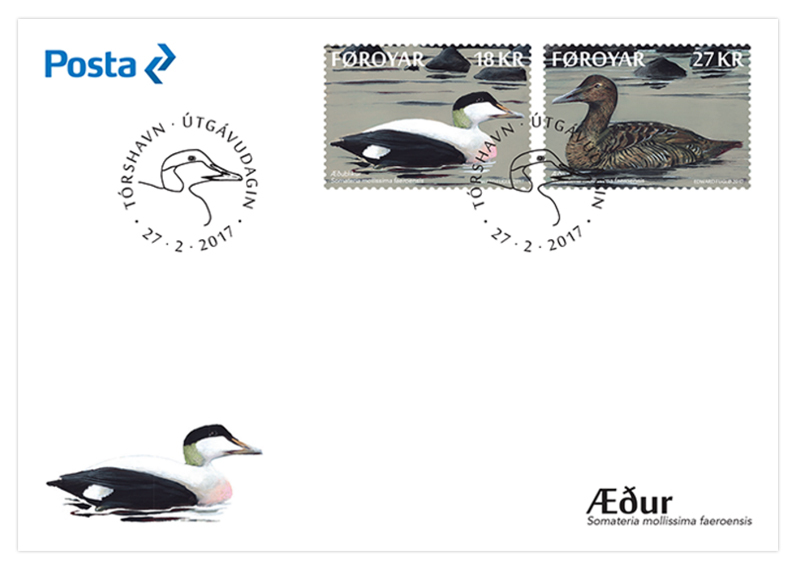 Everywhere, in the fjords along the coasts and in port facilities, you will see large and small flocks of eiders gently swaying on the waves in all kinds of weather - the males in their beautiful black and white pairing suits, with a hint of pale green at the back of their cheeks and neck, sometimes with a touch of pale red on the chest, and the females with their discrete gaudy plumage in light and dark shades of brown, the perfect camouflage when they hatch in nests. The Faroese eider is a subspecies of Somateria mollissima (Somateria mollissima faeroensis), found only in the Faroe Islands. It is a non-migratory bird, seen along coastal areas in the islands all year round, being the Faroes’ most widespread and largest wild duck (size up to 58 cm). The eider’s hatching period stretches from the end of April until early September. Due to its relatively docile nature, it most often builds its nest by the shore – while sometimes also laying its egg in the outfield. Generally, however, the eiders brood in colonies, so-called “varp” where they are better protected against predatory birds. The nest consists of torn grass and moss, and when the female has laid its 4-5 eggs, it lines them with down, plucking it from its breast. When the parent bird leaves the nest to forage, it covers the eggs with down to keep them warm. Traditionally eider down has been a valuable resource, being used as stuffing in duvets. In some areas of the islands islets and skerries where eider brooded have been protected in order to reap the down. It helped that the eider is unusually tame - there are stories of reapers effortlessly lifting the bird from the nest, gathering the down and putting the bird back on the eggs, causing no further drama. The eider then plucks its breast, wadding the nest anew. As soon as the young are hatched, they are ready for life at sea and leave the nest with their mother. Eiders and their young gather in flocks along the coasts where they feed on isopods (Idotea), crustaceans, small crabs and fish. The eider is an excellent swimmer and can dive to a depth of between 3 and 20 meters. The adult eider may seem rather ungainly in flight, flying low above sea level, sometimes touching the water with its feet in order to pick up speed. However, I know from personal experience that the eider can fly with an impressive speed. Years ago I was driving along the coast of Skálafjørður, where an eider took off from the water and flew a few kilometers parallel to the car. All the way it kept pace with vehicle at a speed of 80 km per hour, using only a few meters to land next to another eider. In summer, the males lose their splendid plumage for a short period and start looking more like the females. But at the end of the summer, they regain their colourful plumage. You will then be able to distinguish between the sexes as the chest of the young males gradually becomes white. 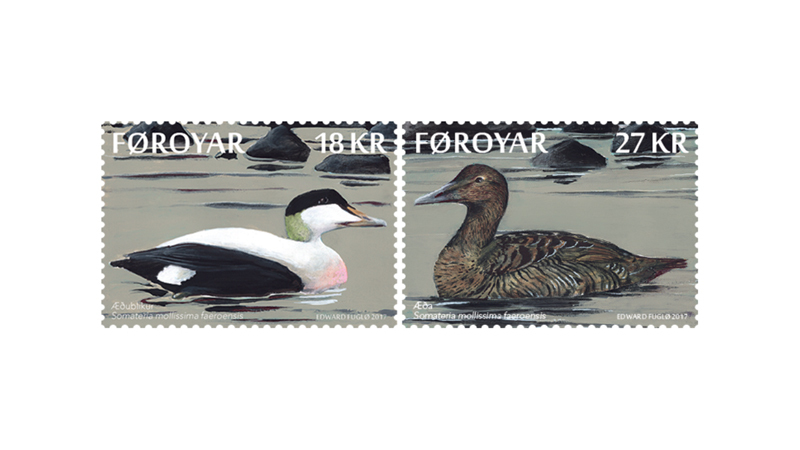 As stated above, the Faroese eider is a sedentary bird found in the Faroes all year round. It has no need of migrating to warmer countries since the warm Gulf Stream keeps the waters along the coasts at a fairly constant temperature. You will therefore be able to see this beautiful bird in all seasons. Even in stormy weather flocks of eiders can be seen swaying in turbulent seas, almost as a symbol of the calm, almost phlegmatic temperament needed to survive out here in the powerful grips of the Atlantic Ocean.